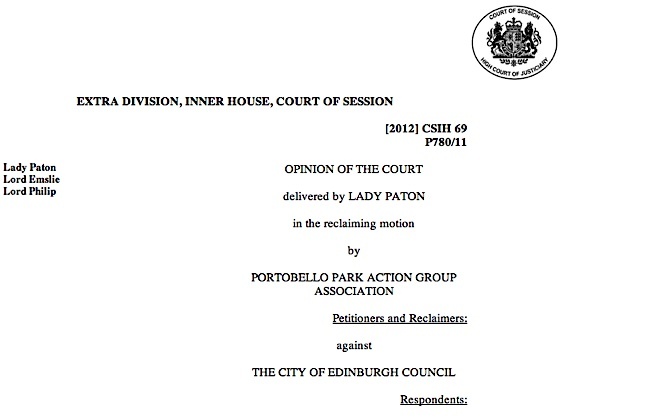 Lady Paton handed down a dramatic decision of the Inner House of the Court of Session today and ruled that Edinburgh Council does not have the legal authority to build a new school on Portobello Park. This has been a long-running saga and has, tragically, caused very deep divisions in Portobello which I will come to in a moment. Briefly the story is as follows. Edinburgh Council is keen to replace the ageing and decrepit Portobello High School and build a new school fit for the 21st century. After examining a variety of sites, it chose Portobello Park as the preferred site. This led to a the Portobello Park Action Group (PPAG) being formed to campaign against the building of the school in the park. They complained of the loss of greenspace and also brought into the debate the fact that Portobello Park is common good land (a fact initially disputed by the Council). Common Good land is subject to a range of restrictions on how it can be disposed of and used. The Council sought it’s own legal opinion on whether it had the authority to go ahead and satisfied itself that it did. Planning consent and contractual matters where then agreed. In July 2011, PPAG sought a judicial review of the Council’s decision to build the school and on 7 March 2012, Lady Dorrian rejected the pleas of PPAG and gave the green light for the Council to build the school. Her grounds were that the PPAG were too late in bringing their case and that, in any event, the law on common good gave the Council a wide discretion to appropriate common good land. PPAG appealed and today Lady Paton upheld the appeal and concluded that PPAG were not too late and that the Council have no authority to build a school on common good land. I offer a few brief observations. I was wrong when I offered the view that this appeal was unlikely to succeed. My view at the time was informed by the narrow point in law and the lack of much legal precedent for situations where a local authority was “appropriating” as opposed to selling common good land. Lady Paton’s ruling makes it very clear that there are significant hurdles to overcome before inalienable common good land can be appropriated for another use. The law on common good is vague and always open to the interpretation of the Courts. Several attempts since 2004 to persuade the Scottish Government to review the law have fallen on deaf ears. The law does need placed on a new statutory footing. Common Good features as a modest part of the consultation on the Community Empowerment and Renewal Bill but what we need now is a new statute. I and others are working on such a statute and hope to have the draft outlines of a Bill ready by the end of 2012. Citizens of Scotland’s burghs should have the right to take legal action in defence of their common good. However, the appeal by PPAG was, in part I believe, driven by the self-interest of property owners in the vicinity of the park. The City of Edinburgh Council should have known that this land was common good. That they did not is a reflection of a long history of neglect in the stewardship of the Common Good Fund. At an early stage the Council should have sought legal authority for their proposals. This is common practice. Their failure to do so contributed to today’s outcome. The community of Portobello has been left deeply divided. This is tragic when the matter at hand is the building of a much needed news school.But the reasons for this division is not the need for a new school but the inadequate legal framework governing common good and the arrogant behaviour of the Council. Local government needs reformed. Indeed, we do not have local government – merely a poor form of regional government. Decisions about common good in, say Pittenweem or Perth should not be taken by Councillors representing the whole of Fife or the whole of Perth and Kinross. Edinburgh, admittedly is a bit different in that its government is solely concerned with the City (though South Queensferry’s Fund is distinct and historically Portobello and Leith have been absorbed). Finally, let us not forget in this whole sorry tale the young people of Portobello who deserve a new school. It is tragic that this now seems as distant a prospect as it did at the beginning of this saga. (1) 1417hrs Robert Sutherland, advocate rightly points out that the abolition of feudal tenure has no bearing on the status of land as a common good. This is correct. He goes on to point out that feudal burdens are not always lost if not preserved. I will encourage him to elaborate further by way of comment on this post. UPDATE 1 October At the time tis blog was written, I accepted as fact that Portobello Park was common good since it was agreed between PPAG and CEC that it was. Subsequent evidence has cast doubt on this matter. Robert’s point is that the Abolition of Feudal Tenure etc. (Scotland) Act 2000 only abolished the right of *the feudal superior* to enforce the burdens in a Feu Disposition if he didn’t take steps to preserve it. The Act didn’t affect the right of *third parties* to enforce them. Which feudal burdens are enforceable by third parties and who these third parties are (because it’s much narrower than any member of the public) is a ferociously complicated area of law. The Inner House did not “miss” the significance of the burden in the Feu Disposition. The point “wasn’t fully argued” before them (para ). Probably because this burden was not one which had third party rights of enforcement attached to it and/or, if it had, because PPAG was not one of the third parties. But even if not enforceable by PPAG (or, I suspect, anyone else) as a *burden*, the words in the Feu Disp still have significance in that they’re evidence that the park was an addition to Edinburgh’s common good fund rather than an acquisition under statutory powers and, moreover, that it was *inalienable* common good. That, at least, is what the Council appear to have accepted. The decision of the Inner House is probably correct as the law stands although I could imagine grounds for appeal to the Supreme Court along the lines that the omission of the words “or appropriate” from section 75(2) of the Local Government (Scotland) Act 1973 is a pure drafting error and is it credible that Parliament meant to provide a mechanism for the outright *disposal* of inalienable common good but not for the lesser step of retaining it for an alternative use? But if not, it’s ridiculous there’s no mechanism to appropriate inalienable common good to an alternative use. The power of the Lands Tribunal to waive burdens (including those enforceable against local authorities) has existed since 1970 and it’s only because this one had the extra (and possibly unintended) effect of rendering the land inalienable CG that it remains immune from challenge by perhaps anything bar a private Act of Parliament. Either the appropriation of inalienable CG needs to be brought within the purview of the Lands Tribunal or else (better still) s75(2) needs to be amended by adding references to appropriation. On the wider issue, I agreed with your tweet that the law of inalienable CG probably developed as a defence against corrupt and undemocratic local authorities to prevent them squandering public assets. Once we have rejuvenated local democracy, the need for CG will disappear. But I look forward to seeing your draft CG bill as an interim measure, anyway. EDIT – just looked at Robert Sutherland’s tweet again. He’s talking about a 200*3* Act. I suspect he means the Local Government in Scotland Act 2003 (which the Court decided had no bearing on appropriation of inalienable CG) rather than the Abolition of Feudal Tenure Act 2000. Or am I looking at the wrong tweet? Section 17 of Feudal Abolition Act extinguishes feudal burdens where such burdens are enforceable by (and only by) a superior. So your argument is that these burdens could be enforced by third parties and thus remain extant? Anyway, as you say, I agree that this is academic since once the land is inalienable common good it matters little what burdens created over 100 years ago. I tweeted earlier about the possibility of a Private Act of Parliament. Indeed one of the earliest Acts of the Scottish Parliament was the National Galleries of Scotland Act 2003 which was designed to remove some land in Princes Street Gardens from the scope of the City of Edinburgh District Council Order Confirmation Act 1991. Yes. There are some feudal burdens which were enforceable by the superior alone and others which were enforceable by the superior and third parties as well. Section 17(1)(a) extinguished the former type (unless the superior had taken steps to preserve) while s.17(1)(b) abolished the right of the superior to enforce the latter type (unless as before) but left the right of enforcement of the third parties intact. In short – and contrary to popular belief – feudal abolition did NOT abolish all feudal burdens. Feel free to e-mail me if you want any further explanation of this (although it’s not really relevant to Portobello). Well it seems the kids of Portobello have been stiffed once again. Money talks, QC’s talk and a Law that needs to be clarified is used against the majority on a technicality. Well done Scottish Government. WHAT have you been doing Kenny, ASBO’s for dogs? I’m a distant voice on this now but can only say I agree with Willie W Legal point scoring whilst a school falls down about the kids ears….. I am not a Lawyer / Advocate / QC / Judge. So perhaps I am being simplistic when I say the law should be applied in a fair and just manner.Then again, I am perhaps far enough away from the subject that minute examination of legal issues does not interfere with my straightforward ideal that law on Common Good should relfect Common Sense. This decision has shown our legal system and our Government in a very bad light indeed. Just as a little question to any experts out there. What do you think the outcome would have been, if this land which was purchased, had not been taken into the Common Good Account by the last Council. The land was never purchased – it was gifted to the Town Council in 1898. City of Edinburgh Council have no choice about whether it is common good or not – that is a decision for the Courts to rule on if necessary. It does not matter which “account” the Council hold the land under – that has no bearing on its common good status. After being advised in 2006 that the land was common good, the Council denied this citing the alleged removal of the feudal burdens. That was irrelevant and if the Council had taken the common good assertion more seriously, it could have devised a means to build the school and avoid all this angst. Sorry to correct you, but I seem to recall the land was most certainly purchased. The first Golf Course was situated along the back of houses at the south of Argyle Crescent. The rail line was run along there (now the Harry Lauder). Replacement land was then purchased by the Council and the new Portobello Park and bigger Golf Course was born. I think the sum was £25k. A fellow campaigner had a copy of the deeds. Do you need proof? Unlike PPAG I could apoligise if I am wrong. As for the rest of your post, I have no reason to disagree. £25,000. it was scanned onto talkporty and was the doc I read previously. But again it is old ground. Demolish the current school, temporarily move the pupils to other schools, rebuild the school on current site, green space protected. Everyone’s a winner!! This was suggested. The demolition / rebuild was to take 3 full summer’s and 2 complete school years. It was admitted this could be extended as there had not yet been a type 2 demolition survey which could extended this even further. Roy Jobson (Education CEC confessed he had been involved in a partial decant (50% of school I think) which was “a nightmare”. There was no space in schools to punt 1,400+ pupils. It would have been a Nissan hut decant to …. Portobello Park. 1,400+ pupils decanted to a park for at least 2 years and rebuild on a site which is far to small. Then in 40 years do the same thing again. Who wins exactly? Pupils? Parents? Teachers? Tax Payers? It is an old discredited arguement. Brian….What other schools should 1400+ pupils be moved to? And how long are our children expected to be in other schools for? The current site is just not big enough for the new school anyway. Do we not want to give our kids space for sports? Also St Johns is in need of expansion into space taken by the current school. So tell me how the kids that are spread out all over the place are winners? The only winners here are the NIMBYs. The land wasn’t gifted. As William says, it was purchased for the sum of £25,000 (£2-£21 million in today’s money depending on the metric). Apologies for the misleading comment and thanks to Sean and William for correcting me. I do wonder why Miller sold this land for a park in the first place. Anyone know if he lived nearby and was protecting his own amenity? I was told by someone he was a housing developer. If so he may have been protecting the development value of his remaining land. Hardly the great philanthropist and social benefactor that some PPAG supporters paint him then? More likely that the private greed of a wealthy individual back in the 19th century is having unintended consequences for the children of the 21st. Time this mess was sorted out one way or another. Common Good and commonsense should not be mutually exclusive terms. I expect the Council’s lawyers went into this exhaustively but if I’d been one of them, the revelation that the Council paid £25k (about £2.7m in today’s prices according to the Bank of England’s inflation calculator) would have set off a *massive* alarm bell in my mind as to whether this was common good at all. There’s no doubt that a council’s CG can be added to by *gift* but do Councils have power at common law to *buy* additions to their CG? The only circumstances in which I would have thought that allowable would be if the Council had sold £25k worth of their CG elsewhere and then used the proceeds to reinvest in this land at Porty. In that case, the purchased land would be CG in substitution for the sold land. Andy, if you researched the history of the park (yes? ), did you discover that that (an exchange) was in fact what happened? Do we know which fund the £25k price was paid out of? Town Councils could add to their CG Fund through acquisition as well as by gift. Magistrates of Banff vs Ruthin Castle 1944 SC36 cited with approval by Inner House decision in Wilson vs Inverclyde states that CG land is all land acquired by a burgh other than by exercise of its statutory powers or that is held in a Trust. So whether or not the £25k came out of the CGF or not makes no difference (an important point though is that if the CGF monies are used – such as in acquiring the land for the New Town – then it becomes CG regardless of any legal tests). The deed as I recall refers to an agreement reached re the incorporation of Portobello burgh into Edinburgh – it was part of the deal as I recall. I can’t find the deed and have no time at the moment to hunt it down. Don’t disagree except my point was where did the Council get the £25k from to pay for the park? Whichever way you look at it, when land alleged to be CG has been *purchased*, it’s critical to know where the money came from. Sorry if this is too boring for the non-lawyers! I don’t know where the £25,000 came from. But I don’t think it matters. Statutory powers test relates to the purposes of the acquisition rather than the simple fact of spending money (which is clearly an exercise of statutory powers to spend money). So if land acquired under the powers conferred by Section x of the Housing/Sanitation/Roads etc. Act then not CG but if no statutory powers invoked and a straightforward outright acquisition of land using money from whatever legal source (rates/trust funds/sale of other land etc) then it is CG. That is my understanding. So are you saying that a Council finding itself with a surplus on its education and/or sanitation account (both statutory functions), for example, would be at liberty to transfer that surplus to the common good account (a non-statutory function)? Surely the first rule in the public sector finance book is that money raised by the authority of statute can only be spent on the authorised statutory purpose. The same must apply to money indirectly raised by statute such as rents or sale proceeds from land previously bought in pursuance of statutory authority. You need to ask a public finance specialist. All I know is that the source of the money is not a determinant of CG status of the land acquired. The rules no doubt will be different now from what they were in 1973 to what they were in 1947 to what they were in 1898 etc. I would guess the same liberties do not apply today as they did 100 years ago. Not a “determinant” perhaps but about 90+% persuasive, surely? If the money came out the education account, then it’s statutory, if it came out the sanitation account, ditto. Etc. I don’t thnk Councils (now or in the 1890s) maintain(ed) “slush funds” of money from indeterminate sources they’re at liberty to bung into common good if they can’t find a better home for it! Plus, I would guess public servants had a far clearer awareness of all this sort of thing 100 years ago when there were far fewer statutory powers around and the CG had its head a bit higher out the water. Compare with nowadays and that 2003 Act saying local authorities can do whatever they want and which the Court in the Portobello case reminded doesn’t mean they can ride roughshod over the niceties of CG. Victorian town clerks had a far clearer sense of public duty than the Georgian ones responsible for the dilapidation of the CG described by Tom Johnston and quoted by you in TPHNL. I am inclined to agree. It is just that there is no legal authority that I am aware of that says that land acquired which meets the definition in Magistrates of Banff vs Ruthin Castle is not so if the money came out of eg Education account. I have a copy of Hunter & Paton’s Report on the Common good of the City of Edinburgh 1905 which reports that in the years 1894 to 1904 expenditure on the CG account totalled £324,050 and revenue £236,820. There is no record of the acquisition of Portobello Park which is shown on the map as a Public Park but not part of the Common Good. The assertion that the park is common good derives from the Mag Banff case but has never been tested in Court (PPAG & CEC agree it is common good as do I). Hunter & Paton do say that the CG is “being supplemented in our time in another direction, by the provision of Parks and other assets which will be handed on for the benefit and use of the community in perpetuity. All these are being paid for by instalments from the rates which will, in the course of from twenty to fifty years – no great period in the life of a City – clear off all of the original purchase price so that Edinburgh citizens of the future may enjoy not merely the old Common Good, but this new and ever-growing Common Good contributed by the rates under Statute.” (Hunter & Paton, Report of the Common Good of the City of Edinburgh, 1905). So it’s CG land, regardless of whether it was bought at current market price or gifted? Bob – to clarify Andy’s comment, I would add that, if it was *gifted*, it’s almost certainly CG (except perhaps in the unlikely event the donor requested otherwise). But if it was *bought* – whether at market price or something less – then it depends where the money came from. So, this idea of disposing of the land to a community development trust – what obstacles would it have to overcome? It seems crazy that the Council can’t build a school on Common Good land, yet it can dispose of it. And once sold, it loses its CG status? I’m beginning to feel that I’ve fallen down a rabbit hole. Land would lose its CG status if the Courts authorised the sale. Would there be scope for a group of like minded indivduals or the council to challenge the CG status of Portobello Park. And would there be any point in doing so? Well the common good status has never been confirmed by the courts. It is merely an agreed fact by PPAG and the Council. I also believe the land is common good according to existing legal precedent. I doubt such a challenge would be wise. Thanks for that- I’m simply trying to think of angles to undo this perverse decision. Over on Talkporty a member has thoughtfully typed up the pertinent sections of the disposition, makes it easier to read. ” I, Sir James Miller of Manderston in the County of Berwick, Baronet Heritable, Proprietor of the Lands and others after disposed in consideration of the sum of Twenty five thousand Pounds sterling now paid to me by the Lord Provost Magistrates and Council of the City of Edinburgh … do hereby sell alienate and in feu form dispone to and in favor of the said the Lord Provost Magistrates and Council of the City of Edinburgh and their successors in office as representing the Community of said City heritably and irredeemably, all and whole that area or piece of ground part of the lands of Easter Duddingston belonging to me as the said area or piece of ground is shown and delineated and coloured pink on the plan annexed and signed by me …. videlicet on the north north west and north in the first place by the street or road called Stanley Street in the second place by the ground feued by me to Miss Mary Elizabeth Burton and in the third place by ground belonging to the North British Railway Company and the ground belonging to me hereby feued may be on the east by the road called Hope Road [Hope Lane] on the south by the road called Milton Road and on the west by the street or road called Duke Street [Park Avenue] which area or piece of ground hereby disponed is part and portion of all and whole certain parts and portions of the Lands and Estate of Easter Duddingston belonging to me lying within the Parish of Duddingston and County of Edinburgh. Primo. That the area or piece of ground hereby disposed shall be used exclusively as a Public Park and Recreation Ground for behoof of the Community of the said City and it shall not be competent to nor in the power of any said dispones or their foresaids to erect or build or give liberty to any person or persons to erect or build houses or buildings of any kind whatsoever thereon except buildings to be used as a house or houses for the Park Officers and Gatekeepers to be employed by my said disponees or for other purposes appropriate to the uses of the area or piece of ground thereby disponed as a public park or recreation ground. What defines Common Good? I understand that a park can be for the common good but how can a school that serves the people of the community not be described also as Common Good? If the majority of people in that community decide that a school on the park is for the Common Good why can’t one replace the other? For a lowly IT professional like myself there is far too much ambiguity in the law regarding this situation. What if the people decided to hold a referendum and decided that a school in the park was for the common good would that have any credence? It is high time we knew what the people of Portobello actually feel about this. If a referendum were organised and approval was given to building on the Park this would strengthen the case for a Private Parliamentary Act. Thanks to Bob for linking to the original full text of the deed and to Talk Porty member “rathbone” for typing out the significant parts. First, I have to slap my own wrists for having pontificated on the deed after having only seen the quotation from it in the court judgement but not the full text (when I said in the first post in this thread that the quote was evidence the park is inalienable common good; now I see it in the context of the whole, most particularly that the Council paid £25k for the land, it’s no such thing). Should have known better. Where I *disagree* with Andy (and he must correct me if I am misunderstanding him) is the idea that, just because a conveyance of land to a LA does not mention a statutory purpose (as is the case with the Porty Park deed), that means that the land was not acquired for a statutory purpose and must consequently be common good. It does not. What a deed says – or more to the point does *not* say – is in no way conclusive and you have to look into the background circumstances of the acquisition to discover if the land is CG or not. The sort of factors that will be relevant will be where did the money come from (which account, was it a gift etc.) and which committee resolved to acquire the land? Do the minutes of the committee reveal the motivation for the acquisition? In the case of Porty Park, I don’t know any of the background circumstances of its acquisition so I’ve no idea what compelling evidence there is that led the Council to concede to PPAG that the park is CG. Does anybody out there know? Andy? There appear to have been FOIs including release of the Council’s legal advice – has anybody seen these? I expect there must be compelling evidence or the Council wouldn’t have made the concession but in all the circs here, I think we’re owed the reassurance of being able to see why the park is deemed to be CG. I also agree that the law is in an unsatisfactory state when land’s status as common good – which has a fundamental bearing on what can and cannot be done with it – is only discoverable from research into ancient records rather than transparently from a modern public register. This is in stark contrast to other recent developments to promote transparency in the rights and obligations relating to land such as legislation to bring the Land Register up to date and introduction of a Register of Crofts etc. I do not argue that a deed containing no statutory purpose is by definition CG. If a deed mentions the statutory purpose (the Council under the powers conferred upon it by the Housing Act of xxxx etc) then the land is clearly not CG. If there is no mention of there use of statutory powers, however that does not mean that it is common good. There may well be contextual facts (most typically in Minutes of the Council) and so the full circumstances must be looked at. However, where there is a dedication to public use (as there is here) that is usually taken as conclusive beyond any need to explore the context. I think the Council conceded the park was CG because of the dedication to public use. I do recall, however, that the park was sold as part of the agreed deal whereby Portobello would merge with Edinburgh – I am not sure whether that has any bearing on CG status or not. We all seem to be asking for clarification on C G. I must admit I get totally lost with the finer points of legal documents, but in this case why was it not C G then it was. Under a Labour administration it seemed not to be an issue. Then after an election, the Lib Dem led coalition announced it was to be taken into the C G fund. Why was this? Were they lobbied from within by a PPAG supporting Portobello Lib Dem Councillor? Were the previous administration blocking any anti school protest. Certainly it was the same full time officials advising? Have other political issues come to influence the decision? I have always been suspicious of the motives here, I have never been comfortable with the decision that Porotbello Park is actually Common Good or not. Surely there should be some sort of an independant body deciding / advising what is Common Good and what is not. Then people like me can put their suspicions to one side. Fair do’s and I stand corrected about your understanding of the significance of the absence of any reference to a statute in a deed. However, I disagree with your statement “where there is a dedication to public use (as there is here) that is usually taken as conclusive beyond any need to explore the context.” Can you quote authority for that? I tend to think that a dedication to public use may be an adminicle of evidence in favour of CG but by no stretch conclusive. What about a council buying land under the Public Parks (Scotland) Act 1878 with no mention of the Act in the deed but subject to a burden only to be used as a park? Would that not be acquisition for a statutory purpose and thus not CG? Dedication is covered in 4.4 of Andrew Ferguson’s Common Good Law (Avizandum, 2006) and CG arising as a result of a grant in 4.5. These are two of the three tests of the Murray v Magistrates of Forfar case. On the question of the Public Parks Act you have hit on a very interesting conflict arising from the application of the Magistrates of Banff ruling. This question has been brought into focus in a case in Glasgow concerning a part of a park sold to the NHS. I don’t recall all the details but Glasgow Council I think was arguing that land bought for the purposes of a park was acquired using the statutory powers conferred by the 1878 Act and that it was therefore not CG. Edinburgh could argue the same in relation to Portobello. So much of the law remains unclear. Ferguson’s book is the best guide to where we are at right now. I don’t have access to Andrew Ferguson’s book but in Murray v Forfar, the issue was not whether the land was common good but whether it was *inalienable* common good. The question of dedication to public uses is central to whether CG is inalienable or not but it is not relevant (or perhaps I should say more accurately it is just one of many factors but certainly not conclusive on its own) as to whether the land was CG in the first place. I think – with respect – you’ve seen the burden in the Portobello deed limiting the land to use as a park and jumped straight to the conclusion from that alone that that made the land *inalienable* CG without stopping to consider whether it was CG in the first place. Land can’t be inalienable (for Porty purps, read “not appropriate-able”) if it’s not CG. If I am still misunderstanding you, then please correct me. You are right on the Murray v Forfar case. As to the question of dedication, when I said that a dedication in a deed was usually conclusive I meant in relation to instances where the Magistrates of Banff test had already been applied (land that had ben acquired by the burgh and not held in a trust or acquired using statutory powers). The dedication in the deed is the icing on the cake so to speak. I will email you an opinion of Professor Rennie (actually a supplementary – I can’t find the original) and will be posting a link to the City of Edinburgh’s opinion on Portobello. I agree that the status of Portobello as CG is merely an agreed position by PPAG and CEC. I am of the view that it is CG but it is one of the deficiencies of the process that this has never been confirmed. What should have happened was petition by CEC (possibly jointly with PPAG) to the Sheriff Court to rule on the question of status and competence to appropriate. That opinion you’ve linked to doesn’t advise on whether the park is CG or not. It only advises the Council (wrongly as events transpired!) what to do in light of its concession that the park is CG. Why are *you* of the view that the park is CG, Andy? I do not have a view on whether it is CG or not. I was asked 6 years ago and, having seen the title deeds and the background (purchased for purposes of a park, dedicated in the deed, and consequent on an agreement reached over the merger of the burghs of Edinburgh and Portobello), advised that it seemed to me that it probably was but only a court could decide. I have not seen the Edinburgh Extension Act. Clearly if the acquisition forms part of the Act then it was acquired using statutory powers. Equally, the Council could argue that it agreed to purchase it under the powers conferred on it by one of the Parks Acts of the 19th century. Without knowing all the facts it is not possible to conclude either way. Sorry – I am aware I have said two conflicting statements -” I am of the view that it is CG” and “I do not have a view” on whether it is. On the basis of what I now, I am of the view that it is CG but I don’t know all that needs to be known. Hope that clarifies matters! Ref. your clarification, you never told us you were a script writer for Sir Humphrey Appleby!!!! I have a lot on at the moment – so sorry for confusion. I have no idea why Talk Porty say what they say in relation to my views. I don’t know on what basis this person is saying this. I just think one always has to be very, very careful before rushing to court. At present there is insufficient information to take a view on the likelihood of any such action being successful and if so, what the consequences would be. My instinct is that this land is in fact common good. On that basis (but in the absence of further information), it would not be sensible to challenge it at the moment. If it became clear there was a strong argument that it were not CG then obviously a court ruling to that effect would have dramatic consequences. Ah – I see. Well, to clarify, we don’t know the full facts. We don’t know what the Edinburgh Annexation Act says and we don’t know the precise nature of the agreement reached as part of the negotiations over the merger. If, for example, the Annexation Act incorporates a clause which says words to the effect that “The burghs of Edinburgh and Portobello bind themselves to implementation of the agreement signed on xxxx and recorded in the Books of Council and Session ..etc” then the acquisition could be argued to have been made using statutory powers. My feeling is that the council would never have conceded common good status unless it was quite sure since it is better from its point of view if it was not CG. Then again, I have had a lot of dealings with CEC over CG in other parts of the City and nothing would surprise me. For the avoidance of doubt – it is not possible to state definitively if the Park is CG or not and it is also not possible to assess either the wisdom or likelihood of success of any action that seeks a ruling on the question. The Annexation Act and the nature of the agreement are both essential aspects to research further. 1) the reason PHS is not being built in Portobello Park is because the park is common good. 2) the CG status has *not* been determined in Court – the Council conceded to PPAG that it was CG. 3) the Council owes an explanation and to make public what evidence was so compelling to lead it to make that concession rather than keep its powder dry for the matter to be tested in court. If I were a councillor, I’d be *grilling* the council lawyers, are they absolutely *certain* the park is CG and is there *any* chance at all of getting that issue in to court even at this late stage? The irony would be laughable if it was not so sad. This was a comment often made by PPAG. Had this been followed it may have blown up on them and given us the school. As a point in principle and regardless of this decision, I feel this should have been done and should be done. On a local point the Golf Course could still be protected by Jubilee status. Could the CEC be taken to court regarding its decision on CG status? Because PPAG said it was CG, because the new administration conceded it as CG, the school may, I repeat may have have been halted on a false premise. A decision hanging on CG on land we are not absolutely certain is CG. I feel an FOI question coming on. That “report of January 2008” and “decision of counsel” referred to there seem to me to be fairly crucial documents. In light of the information which has been uncovered from Edinburgh Council’s archives (Edinburgh Extension Act 1896 and minutes and accounts relating to the acquisition of the park), is it still your instinct that it’s CG and/or do you believe there is now a “strong argument” that it’s not? I believe that there is quite a persuasive case that it is not. I plan to write a blog on the topic this weekend.